Pastel hair has been back on the fashion scene for a few years now, and I can only hope it’s here to stay. I’ve been dyeing my hair since I was 12, and am no stranger to drastic looks. 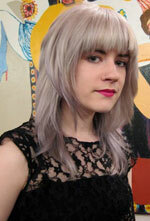 Salmon pink pixie, black Joan Jett shag, long, amethyst layers, bleached white — you name it, I’ve done it. But after recent years of arduous platinum upkeep, I decided to opt for a lower maintenance, sun-kissed blond, a few shades lighter than my natural color. It wasn’t long before I realized that old habits really do dye (sorry) hard: I was bored to tears by my “normal” hair. So, the second I saw this hair on the Badgley Mischka runway, I knew it was meant to be. My stylist has been pulling darker tones into my lower layers for months to blend in the platinum and I loved the idea of using a dark but “unnatural” color as lowlights instead. 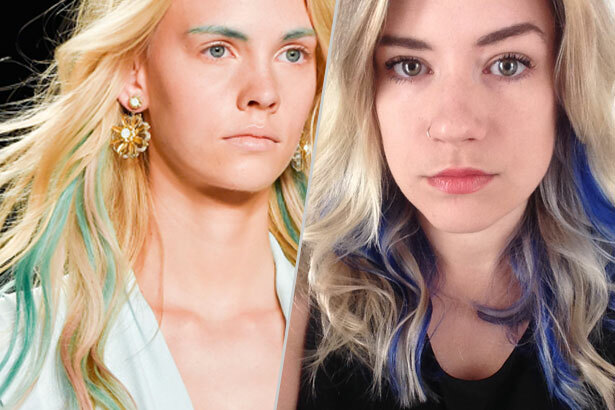 The runway look was likely done with hair chalk or clip-in extensions, but I was determined to recreate it myself. Here’s how I did it by myself at home, and for less than $20.